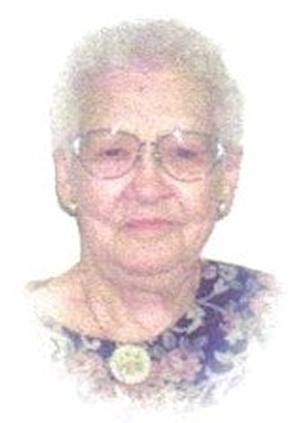 Obituary – Kirk, Ethel Levina (Lau) « Perry High School Alumni Association, Inc.
﻿Ethel Levina Kirk, 91, of Broken Arrow, Oklahoma, formerly of Perry, Oklahoma was the daughter of Emil and Carrie (Garrett) Lau. She was born October 5, 1917 at Orlando, Oklahoma and died Saturday. May 30, 2009 at the Broken Arrow Nursing Home. Ethel was a 1935 graduate of Perry High School. On January 1, 1956, she and Marion E. Kirk were married at Perry, Oklahoma. Prior to her retirement, Ethel worked in the meat market at the M&W grocery store, and later at Charles Machine Works and Perry Memorial Hospital. She was a member of the First Baptist Church, the Jolly 12 Club and the Degree of Honor Lodge. While residing in Perry, Ethel enjoyed bowling at Perry Lanes. Funeral services will be at 2:00 p.m. Wednesday, June 3, 2009 in the First Baptist Church in Perry. Rev. Gary Siess will officiate. Interment will be in Grace Hill Cemetery. Services are under the direction of Brown-Dugger Funeral Home. The family will receive friends from 6:00-8:00 p.m. Tuesday, June 2, 2009 at Brown-Dugger Funeral Home. Memorials may be made to the River Cross Hospice of Tulsa in care of Brown-Dugger Funeral Home, 1010 N. 7th Street, Perry, Oklahoma 73077. Ethel is survived by three daughters, Carla Kirk Childs and her husband, Terry, of Tulsa, Oklahoma, Shirley Crews Ford, of Broken Arrow, Oklahoma, and Charlotte Crews Morgan, of Stillwater, Oklahoma: one son, John F. Crews Jr. and his wife, Sue, of Perry, Oklahoma; 26 grandchildren, 44 great-grandchildren, and one sister, Helen Beckham, of Winfield, Kansas. She was preceded in death by her husband. Marion, in 1975: her parents, Emil and Carrie Lau; one daughter, JoAnn Crews Dancer; three brothers, Henry Lau, Charlie Lau and John Lau; and five sisters, Maggie Sweger, Katie Kemnitz, Lillie Lighty, Jessie Carmack and Eveline Jerome.